We all have been talking a lot about Google’s new social networking site Google+ from last few days. During last few days of my use, I realized that some of its features are totally new and unique like Circles whereas other features are inspired from Facebook. When I accessed my Google+ account for the first time, its stream gave me a feeling of Facebook wall but as I explored it more and more I found few other features which are either same as Facebook or are advanced versions of Facebook. If you are a regular user of Facebook, you will also feel like home at Google+ but when you go to photos section or Circles you will realize that your home is more advanced now. Here I have collected some points about Google+ vs. Facebook. Facebook was the first social networking site to introduce the concept of wall. I think Google has integrated Facebook wall concept into its own social networking site Google+ with the name of Stream. For me it is the same Facebook wall but with other name Stream. I couldn’t find much difference between Facebook wall and Google+ stream. +1 is another feature which you will notice when you sign in to your account. A long time back Facebook introduced the feature to like other users’ status updates, comments, photos and videos on your wall. For me +1 is same as like. While using Facebook you can click on Like button whenever you like your friend’s status update. In the same way when you use Google+, you can click on +1 button when you like the status updates of your friends. Google+ introduced a totally new concept of Circles. Circles allows the users to manage their friends easily. Users can group their friends in different circles of family, friends, acquaintances or anything that they like. Other users will get notified when you add them to your circles. I really like the drag and drop feature of Circles using which users can add their friends to circles. Facebook doesn’t have any such feature like Circles but you can categorize your fiends on Facebook using lists feature. You can create Facebook lists to group your friends like Google+ Circles. You can also delete friend lists on Facebook at any time. Hangout is the video chat feature added to Google+ and it allows you to group chat with other users. Atmost 10 participants are allowed to group chat at the same time. Hangout doesn’t work on mobile devices yet. Facebook also added the ability to video chat among other users recently. But video chat on Facebook doesn’t support group video chatting. You can just do group text chatting on Facebook but not group video chatting. 1. You can mention someone’s name in your status update by using “@” symbol on both these sites. 2. You can share your status update among specific users on Google+ using circles and on Facebook using lists. 3. You can click on Timestamp of a status update to get permalink of it. We would like to hear your experience about Google+. How did you like it? 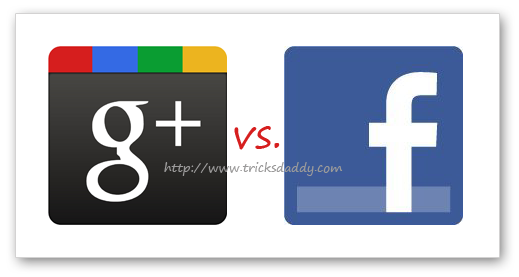 Did you find any difference between Google+ and Facebook? Ya i think facebook is easier to use.. It is cool social networking site….Nothing can beat Facebook! Nice comparison. For me, Google+ is more convenient and easy to use. Since its launch we have learn and heard a lot about Google+. I feel, more or less, there is still not much difference in Google + and facebook. Things are just labeled differently on the sites. The usage and functions are same. After using both of these social networking site . I found that face book is more easy than Google plus . The main reason behind this because Google + is quite new and people have not more knowledge about this . I am agree with you that Google + have more unique program than Facebook because Google has use make this to save the #1 ranking in Alexa. That’s what I want to say in this post. I think most of the features are same but they are labelled differently. Although there are some plus points too in Google+ like we can group chat here but not on Facebook. Good comparison. Keeping in mind the way people are accustomed in using Facebook for so long, it will be quite tough for them to switch to Google+. However, then Google may try to tap on as many new users as they can (first time users of any social networking site). Still, it would make sense for a blogger or webmaster to start using Google+ as well because there are speculations that reference /sharing of a link on Google+ will make a lot of difference in the indexing and ranking of a site. Plus, I have also read that pages like facebook fan pages are also going to be launched sooner in the Google+ Project. #1 Yes google stream is similar to facebook’s wall but the stream allows you to filter content according to the different circles that you’ve made. Instead of the same stuff from the same people, you could select to see things from just your family or college friends or from whatever group you make. This one is actually quite different than facebook. #2 Minor point on google +1. Yes it is very similar to facebook’s ‘like’ button but I think google’s is better worded. What they both do is determine how popular the post is depending on how many people like or +1 it and show it to more people. But sometimes ‘like’ isn’t the proper term for situations like someone dying, a bad accident, or an end of a relationship ect. +1 just signifies that I support your post while giving it a higher priority on the feed. But what I really like though is the connectivity it has with your gmail, youtube, and other google things. Circles adds a lot better privacy with everything. You can choose what circles can see the posts, pictures, or videos you put up. Do you want you family seeing everything on your profile? Really good article though and btw google is allowing more people in again. Cross your fingers and hope you get in, trust me it’s worth it. Facebook has burned me for the last time with it’s new bulls*** chat interface. Google + is something better than facebook but the thing is that still it is not as popular as facebook. When people will really start using Google + then definitely there will be an impact on Facebook. If there is feature I’ve to chose that I love the most, photos would be it. With the Picasa integrated into Google+, you can’t really go wrong. Photos on Google+ are more like Picasa on steroids, its fast, nifty and intuitive. Unlike Facebook where you only see photos of a limited size and resolution, Google+ takes it to near fullscreen placing the comments nicely along the side bar and a slideshow at the bottom. Whats more is that you can edit photos and give some easy touches using the inbuilt photo editor.